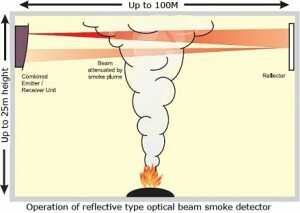 Optical Beam Detectors work on the principle of projecting a beam of light across a room, which is attenuated when smoke is present thus allowing an alarm to be given. There are two forms of beam detector: emitter and receiver separate (single path), requiring separate wiring both to the emitter and receiver, and reflective in which the emitter and receiver are mounted in the same box, and the beam is shone onto a reflective material at the far side of the room (dual path). 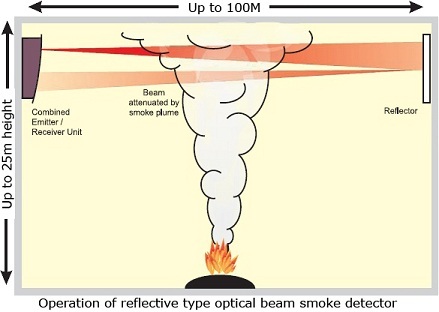 Since an optical beam detector senses smoke across the entire smoke plume, it tends to be less affected by smoke dilution as the ceiling height increases than point type smoke detectors. In addition a single beam detector can protect a large area; hence they are particularly suitable for protecting large high rooms such as sports arenas, warehouses and shopping malls. Beam detectors are more complex to install than ordinary point smoke detectors and it is advisable to consult an application guide for the use of projected beam smoke detectors before considering the use of these detectors.